Ah, what a place. A place of solitude and rest. A place of quiet and peace.A place where the hustle and bustle of college can be silenced by a single flush. A place where the hustle and bustle of college can be silenced by a single flush. The 2nd-floor bathroom of the Good Library on Goshen College’s Campus. A true gem in the crown of places to relieve oneself. Don’t believe me? Well, I will give you a little visual tour through words. Let’s start from when you first enter the library. You find yourself in front of the Good Library during a sunny evening in Goshen, a rarity, as fall is truly starting to settle itself over the Midwestern campus of Goshen College. The sun has started on its way down and it’s getting close to that perfect golden hour. You make your way into the book palace, a slight pause in your step as you wave a cheerful hello to the worker behind the front desk. A turn to the left and up the two flights of stairs leads you to the room with a large window. You stop for a second and take a deep breath to take in both the sights and smells: the scent of aged books and a fantastic view of Schrock Plaza as the evening glow illuminates the yellow-leaf covered brick. But you quickly shake yourself out of it. As satisfying as the smells and sights were, this was not the reason you came to this blessed place, oh no. Your trip was of a higher calling than the beautiful views from the library window. Taking a complete 180-degree turn, you head straight back to from where you came, but instead of going back down the stairs, you continue past them and stop right before you hit a literal brick wall. 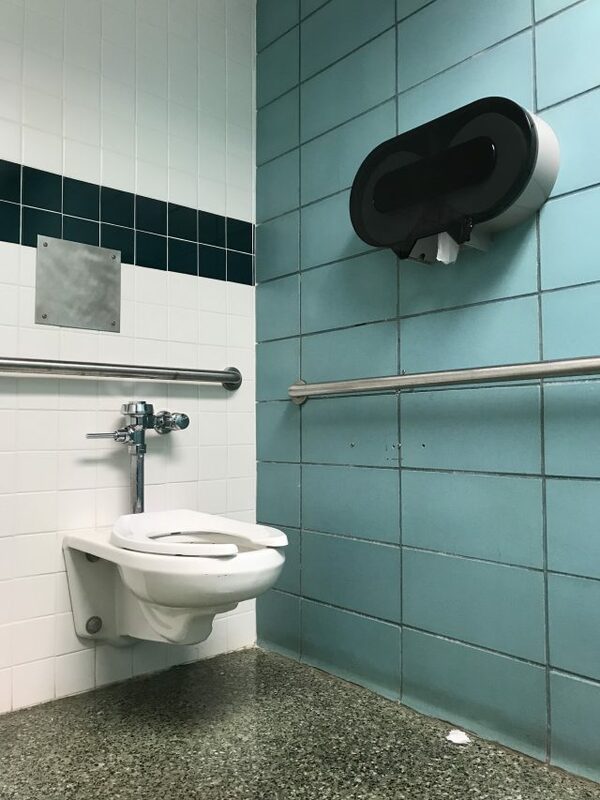 A slow and calculated turn to the right causes your eyes to fall right on the reason for coming to this blessed sanctuary of books: the second-floor bathroom. Relaxation and calm wash over you as you take a deep breath and pull open the door. You step across the threshold. The sight of your own reflection greets you as you take in your surroundings: white tile framing the mirror, two sinks side by side and a light aqua blue tile theme straight out of the ’60s. Looking down you see a beautiful forest green floor, a wonderful mosaic of black and green chipped tile. After noticing how great you look in the mirror, you turn right and head for the best place to do business (other than Newcomer) on campus. The inner sanctuary, the holy of holies, the great beyond. Spacious and amazingly clean, you set down your backpack and slide the latch closed.